why is my MacBook slow? I work in an office where everyone has MacBook Pros, and “why is my MacBook slow?” is a common question. Applications can become slow or unresponsive while waiting for CPU work, memory requests or disk I/O to complete. why is my MacBook fan so loud? Standard performance analysis tools like Activity Monitor and top(1) (and any third-party tools based on the same foundation) can’t tell you some key information about activity on your system, such as how much CPU consumption is caused by short-lived processes, or which processes are causing disk I/O. DTrace, however, can see (just about) everything. In this post, I’ll cover the top ten Mac OS X DTrace scripts that I use for figuring out why laptops are slow or why applications are misbehaving. Most of these scripts are already installed, a few are from the new DTrace book. I find the default font small and hard to read. The size of the window in terms of characters is also small (80 columns by 24 rows), presumably to pay homage to original Unix terminals of that size. (Why Unix? Mac OS X is Unix under the hood: the Darwin kernel). 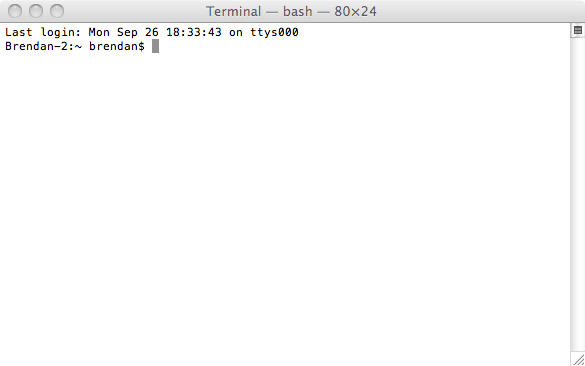 You can adjust the font to your liking in Terminal->Preferences->Text. I use Monaco 13pt, with “Antialias Text” on. Under the “Window” tab is the default size, 80×24, which you can also increase later by clicking and dragging the bottom right corner of the terminal. 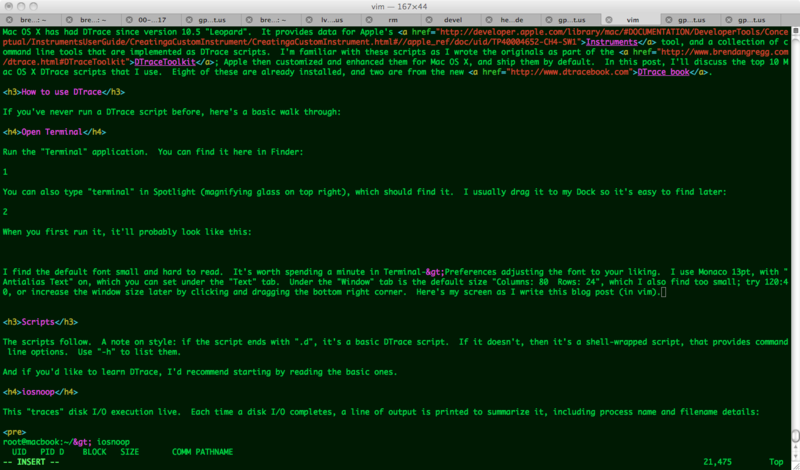 For example, here’s my screen as I write this blog post (in a terminal-based text editor). I’ve truncated the header block to just include the columns. Look at the “%CPU” column to see which processes are making the CPUs busy, and the “RSIZE” column to see who is consuming main memory. The busiest (CPU) process will be at the top, since we sorted on cpu (“-o cpu”). The top was “firefox-bin” (Mozilla Firefox) at 98.8% CPU, which is in terms of a single processor (this has two). If firefox stayed that high you could look for the responsible tab and close it down, or restart Firefox. After top, I turn to DTrace. DTrace requires admin privileges, so to use it you’ll usually need to type in a password to authenticate, provided you have administrator access (if you aren’t sure you do, click here to see how to check). If sudo says “permission denied”, check your admin status. The scripts follow. A note on style: if the script ends with “.d”, it’s a basic DTrace script. If it doesn’t, then it’s a shell-wrapped script that provides command line options. Use “-h” to list them. And if you’d like to learn DTrace, I’d recommend starting by reading the basic ones. This lets you instantly find out which applications are using the disk, and what files they are reading or writing to. Disk I/O is typically slow (for non-SSD disks), so an application calling frequent disk I/O (a dozen per second or more) may run slowly as it waits for the disk I/O to complete. The output columns show: UID = user ID, PID = process ID (unique identifier for the process), D = direction (R = read, W = write), BLOCK = location on disk, SIZE = I/O size in bytes, COMM = process name, PATHNAME = trailing portion of file pathname. In that output I caught Google Chrome reading from a cache file (“data_2″), and writing to cookie files (“Cookies-journal” and “Cookies”). TweetDeck also wrote to database files (“td_26_brendangregg.db” and “td_26_brendangregg.db-journal”). The “? ?” is where the path information ends for iosnoop (if you are a darwin programmer and want to take a swing at improving that, see the fi_pathname translator in /usr/lib/dtrace/io.d). For tricky performance issues I often use “-stoD” to get start and end timestamps for each I/O in microseconds, and a couple of different types of I/O time calculations. In hindsight, I should have called it diskiosnoop, since “io” could refer to different locations in the kernel I/O stack. This script answers an iosnoop FAQ: why dosen’t iosnoop see my application disk I/O? The reason is that applications rarely request disk I/O directly, rather, they access a file system that does disk I/O on their behalf. To increase performance, the file system will usually try to cache as much file data as possible in main memory (DRAM). The application may (by some notion) think that it’s doing disk I/O, but it’s actually reading from very fast DRAM, thanks to the file system. Writes can also buffer in DRAM and write to disk later, which also speeds up application performance. hfsslower.d will see a lot more I/O than iosnoop, as it includes file system cache hits. hfsslower.d better reflects application performance, as it measures the same latency that the application directly suffered. The hfsslower.d script is from the DTrace book, and can be found here. To run it, you’ll need to create a text file containing the script (or pull it from the DTrace book tarball), and make the file executable from Terminal by running “chmod 755 hfsslower.d”. Columns are: TIME = time of I/O completion, PROCESS = application name, D = direction (R = read, W = write), KB = I/O size in Kbytes, ms = I/O latency in milliseconds, FILE = filename. If you use the argument “0″, it will trace everything. If I’m chasing down slow I/O, I’ll often use an argument of “10″ for I/O slower than 10 milliseconds. At this point you may think: if you just care about slow I/O, then just use iosnoop. That works to a point, but there can be slow I/O caused by something other than disks (file system lock contention, for example). The other advantage of the hfsslower.d script is that the measured latency matches the application pain suffered, whereas at the disk level you can only assume a correlation. This traces the execution of new processes. This is great at identifying short-lived processes that may be caused by misbehaving applications and can slow down your system. These short-lived processes are usually too quick to be picked up by standard monitoring tools like the Activity Monitor or top(1). This prints a line for each new process that is executed, in a rolling output similar to the previous tools. The fields are: STRTIME = (string) timestamp, UID = user ID, PID = process ID, PPID = parent process ID, ARGS = process name (should be process + arguments, but that doesn’t yet work on Mac OS X; if you want to debug, see pr_psargs in /usr/lib/dtrace/proc.d). Near the end I opened up a new tab in Mozilla Firefox and another in Google Chrome. You can see a fundamental difference: Chrome creates a new process for that tab, Firefox doesn’t. execsnoop has various options, use -h to list them all. I used -v above, to print the time. This traces file opens and prints various details, including the time and error code when using “-ve”. I usually use it to look for failed opens, which can be a sign of misconfigured applications. Discovering their config files and resource files can also be useful. 2011 Sep 30 01:44:19     0     36 mds            9   0 . The files opened to performed this can be seen by the “SystemUIServer” process, beginning with a Preferences file and then some PDFs. Huh? PDFs? What are those PDFs? That’s bizarre. 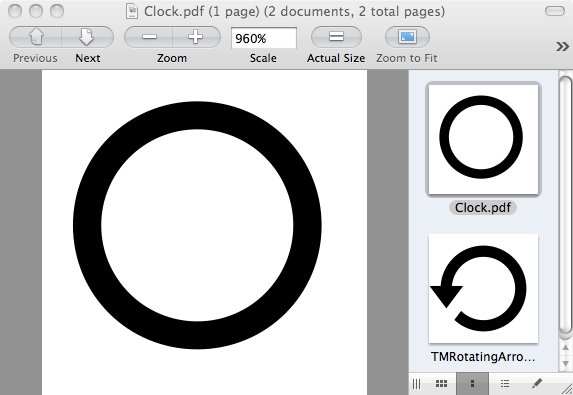 I didn’t know that those tiny icons were implemented as PDFs! The previous two tools, opensnoop and execsnoop, operate by tracing specific system calls. A system call (or “syscall”) is what an application performs to request the operating system kernel to perform privileged work, including process creation, file operations, and other I/O (eg, disk or network I/O). Syscalls are a great target for analysis with DTrace, since examining them often provides a pretty good picture of what an application is trying to do. They can also provide useful details including byte counts, file and process names, error codes, and latency. The output will be many pages, as applications commonly make frequent system calls. 100 lines were trimmed to keep that example short. dtruss supports various options, including the printing of system call timing for use when analyzing performance. dtruss df -h       # run and examine "df -h"
dtruss -n tar      # examine all processes called "tar"
I then look down the “ELAPSD” column for the largest times. A dtruss FAQ is: why is the output in the wrong order? Ryan Dahl (creator of node.js) had been using dtruss so frequently recently that he made some enhancements and posted a newer version on github here. It’s a quick way to find out what applications are connecting to whom on the Internet. The script is here. Columns are: PID = process ID, PROCESS = process name, FAM = protocol family (2 = IPv4), ADDRESS = IP address, PORT = TCP destination port, LAT(us) latency of the connect() system call in microseconds, RESULT = return of the connect(). Many connections these days are “non-blocking”, so the latency appears low and has the result “In progress”. The actual connection completes sometime later (the timing can be traced using some more DTrace, when desired). There is a companion tool, soaccept_mac.d, which shows inbound TCP connections. If you ran both regularly, you may catch something performing networking that shouldn’t be (e.g., spyware, virus, …). This can be another quick way to track down failing or misconfigured applications. Note that (usually) most system call errors are not a problem: it can be normal for system calls to fail, and the calling application handles that condition correctly. errinfo is particularly useful when the application didn’t handle the failure correctly, and the system calls are silently failing. The “value” column shows the minimum size of the I/O in bytes, and the “count” column shows the number of I/O in that range: between the minimum size and the next size shown. To follow an example: the “bsdtar” command shown above performed 151 disk I/Os that were between 32768 bytes and 65535 bytes in size (32K to 64K), which was where most of its I/O fell. The text plot in the middle provides a visualization for the distribution of the events, which shows a spike that corresponds to this 32K to 64K range. Google Chrome did a couple of dozen I/O between 4 and 16 Kbytes. Disk I/O is an expensive operation, so it’s usually preferable for it to be larger in size to improve the throughput to the device. The “? ?” is for where some details aren’t yet available to DTrace, for the same reason as was described for the iosnoop script (if you are a programmer, you can see what needs to be fixed in the /usr/lib/dtrace/io.d file). in /usr/bin/iotop. You may want to make a backup of iotop first (iotop.orig) or copy it somewhere else to run it. Interesting! While tracing I saved the file I was editing in vim, which is seen in the last four lines. This tells me that vim is creating and removing temporary files as part of the save process. Also note that it looks like TweetDeck created the file twice before removing it (two VNOP_CREATEs followed by a VNOP_REMOVE). This isn’t the correct order, which can be seen by examining the TIME(ms) column. A side-effect of DTrace’s negligible performance impact design is that output can be slightly shuffled due to the way it collects data from per-CPU buffers. I often include a TIME column like that one, not just for the usefulness of knowing time, but also as a means to post sort the output. Plus more in the DTrace book. DTrace isn’t just about running scripts; you can write your own custom scripts, run one-liners, and use higher-level tools that use DTrace behind the scenes, like Apple’s Instruments and Joyent’s Cloud Analytics. And it’s for more than just your MacBook: if you are using servers that have DTrace available, you can use it to diagnose their performance and issues too, including tracing kernel and application code. I regularly use it to see how a MySQL database interacts with a kernel file system, for example. For more reading about DTrace, you can see my posts tagged dtrace, other blogs on dtrace.org, the original 410 page DTrace guide, 1100 page DTrace book, and my original DTrace page (which includes the DTraceToolkit). It’s a little old now (and I think prustat needs updating), but there’s also Matty’s Top Ten DTrace Scripts, which includes some of those above; and Greg Miller’s Exploring Leopard with DTrace, which includes Objective-C tracing. 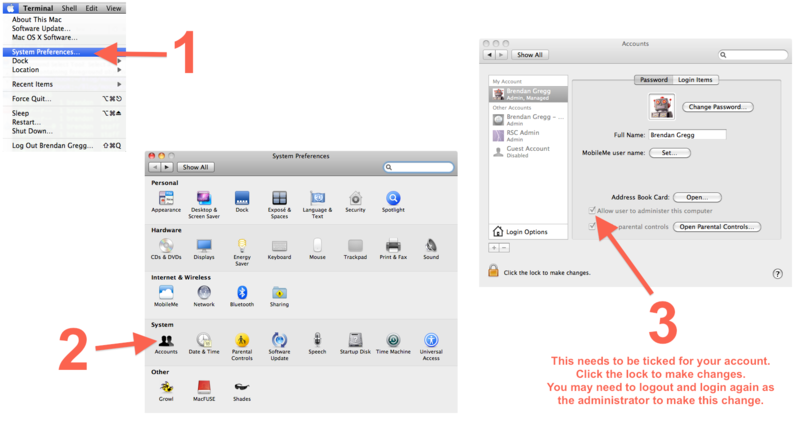 For another post on Mac OS X performance, see my USE Method-based Mac OS X performance checklist. Impressive. Thanks for sharing! Found mdworker indexing a local postgres database with the above – easy enough to fix, once you know the problem. Regarding Mac OS X not having a native system call tracer, it shipped BSD ktrace/kdump for several early releases and has long had a native tools fs_usage and sc_usage. The former captures mast “interesting” system calls while the latter aggregates information about a specific process. thanks, nice work, a good starting point. The reddit comments include a neat TL;DR!